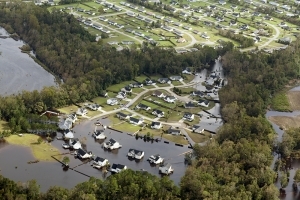 In case you missed it yesterday, be sure to check out an op-ed that appeared on WRAL.com (“Staff, budget cuts left N.C. less ready when Florence hit”) by Robin Smith, who once served as Assistant Secretary for Environment at the N.C. Department of Environment and Natural Resources (now the Department of Environmental Quality). Smith argues convincingly that GOP budget cuts to field offices hindered the state’s preparation for, and response to, Hurricane Florence. “The Department of Environmental Quality – particularly staff in the department’s regional offices – provides the state’s first line of response to environmental impacts. The seven regional offices house staff from multiple state environmental programs including those managing waste disposal, regulating animal operations and enforcing water quality laws. A 2011 budget provision specifically targeted the regional offices for staff cuts and later budget reductions that disproportionately affected water quality programs. By the end of 2016, budget cuts had reduced the state’s water quality program staff by 18 percent compared to 2010 levels. Those reductions were felt most acutely in the regional offices where there was a 41 percent reduction in water quality staff. Those programs have not recovered. Instead, new state funding in recent years has been earmarked for projects with legislative support. Some of those legislative priorities are important, but legislatively mandated projects often did not include funding for additional staff. Without staff, new projects put an additional burden on already depleted staff resources. When lawmakers return to town for a special session next week to deal with storm recovery issues, restoring DEQ staffing and funding ought to be on the “to do” list.